Significant changes were made to the underlying architecture of IDrive for Windows accounts starting 11-23-2011. The current feature-set is described on the regular IDrive website. This page describes the significant aspects of the earlier architecture and provides information on how to refer to the earlier architecture related description. Time-line restore allows IDrive for Windows users to restore data from a particular point-in-time, which is identified by and limited to one of the last thirty actual backups a user’s computer performed. 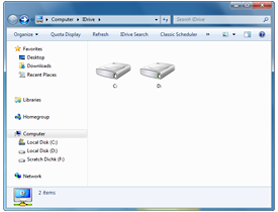 IDrive Explorer is a plug-in that offers virtual folder view of IDrive accounts. 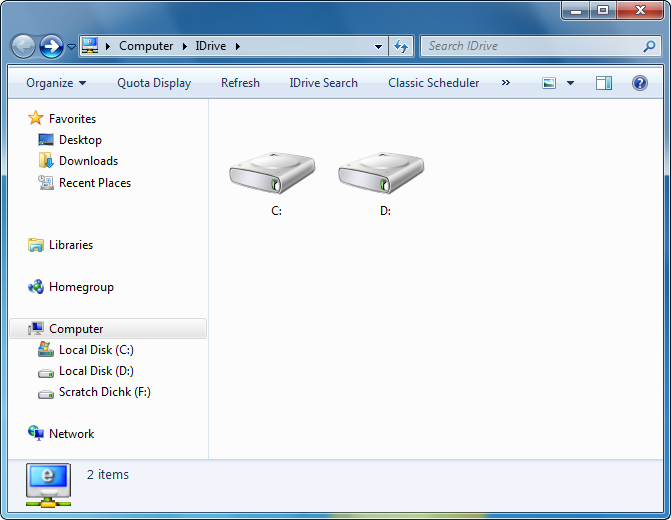 You can view, search and restore 30 versions of files to your local computer by simple drag-n-drop or copy-n-paste (backup/write functionality to the IDrive account is not supported). With 128-bit SSL encryption during data transfers and 256-bit AES encryption on storage, your data is secure. The IDrive for Windows Unlimited Plan (no longer available) is a personal use plan and only valid for one Windows computer per account and does not include mapped drive backups. Under the Unlimited Plan, files deleted on the local computer will be automatically deleted from the online account after thirty (30) days. Additionally, bandwidth is reduced to 200 Kb/sec once the account exceeds 150 GB. IDrive Unlimited Plan accounts store data on RAID devices that protect against multiple drive failures rather than having a redundant backup of the devices similar to IDrive paid plans. Based on historical and statistical analysis of the RAID devices, the chances of data loss is extremely low. However, it is important to understand that there are no backups of these devices and there is a slight chance of data loss. If a secondary backup of backed up data is important to a user, we encourage them to sign up for an IDrive paid plan that provides greater protection with a secondary device that maintains a copy of backups.